Art Deco continues to be one of the most collectable periods in vintage jewelry. This trend is in large part due to the rarity of such pieces, as a great number of Art Deco jewels were broken up during the Great Depression and, then, World War II. The economic circumstances surrounding these two events also contributed to a major change in jewelry fashion in the following decades, turning from platinum jewels set with a multitude of diamonds to designs more heavily focused on large, hollow yellow gold pieces sparingly punctuated with gemstones. It was only in the 1980s that the Art Deco style experienced a renaissance, the opulence of materials and streamlined styling a perfect match for the luxuriant decade. Despite the present economic climate, demand for Art Deco jewelry continues unabated, for reasons evident upon examining any fine Art Deco piece. This brooch, dating circa 1925, is characteristic of the Art Deco style in many respects. Perhaps the most striking feature is the use of bold geometric formscurved silhouettes juxtaposed with straight, and square with circular formsin line with the modernist tastes of the era. 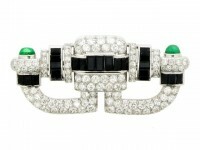 Also bold are the color contrasts, executed with the traditional Art Deco gemstones and metals, here in platinum and diamonds played against black onyx and bright green emeralds. This particular combination recalls decorative arts of the Far East, one of the most important influences on Art Deco designers. The use of lavish materials is also typical of the period, reflecting the economic prosperity of the 1920s. Textural contrast is also rendered by way of gemstone cutsflat baguette cut onyxes, smooth cabochon emeralds, and glittering, multi-faceted brilliant cut diamondswhich all work together to lend an added lushness.